How much juice equals 1 lemon? An average size lemon will yield approximately 1/4 cup of juice. Can 100% juice have added ingredients? In order to ensure the best quality and keep your juice shelf stable, 100% juice may have added preservatives. Per FDA guidelines, an item may be labeled as 100% even when it contains other ingredients as long as these additives do not tamper with the authenticity of the juice’s flavor. These preservatives help keep the natural flavor intact and guarantee the freshness of the product for a longer period of time. Take the mess-work out of adding lemon flavor to your favorite dishes and drinks with ReaLemon 100% lemon juice. This juice makes it easy to add delicious lemon accents to marinades, dipping sauces, or even sodas or juice without slicing and squeezing fresh lemons. 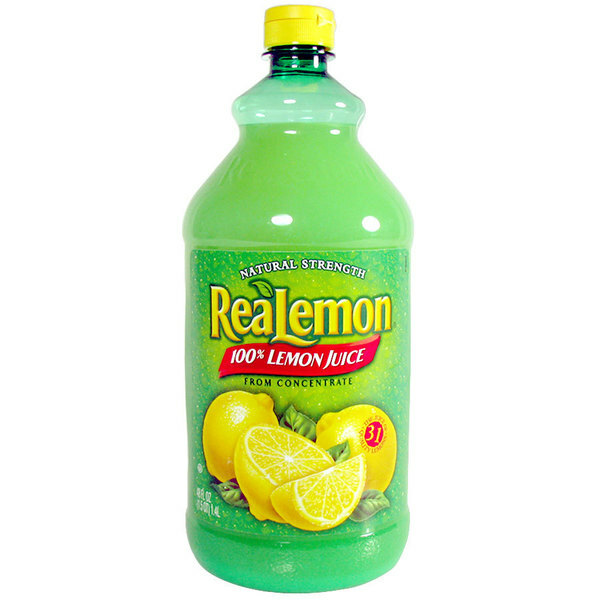 Great for storing in your high volume restaurant or bar, ReaLemon juice provides a consistent lemon taste from each 48 oz. bottle to the next. Consistent and convenient, this lemon juice is ready to use and does not need to be refrigerated until after opening. Its smooth, fluid consistency and sour, tangy flavor is perfect for blending into a variety of dishes and drinks. Stir in lemon juice to create new, fresh-tasting dressings for your salads, or try using this lemon juice to make a classic lemon meringue pie. No signature lemon drop martini, lemonade, or lemon iced tea is complete without a splash of lemon juice. Without needing to slice or squeeze whole lemons, adding this lemon juice to your drinks and dishes is easy! My restaurant used to buy this from Costco all the time, now we have switched to buying it from Webstaurant Store because it is the exact same item and we are saving over half the cost! RealLemon is the real deal. The easy-pour bottle makes it perfect for use in all types of recipes and dishes. The perfect condiment for many fish dishes and has a much longer shelf life than real lemons. Plus, it makes the most amazing lemonade. Perfect for restaurant or home use, this is a great deal. We go through TONS of lemon juice at the bar. It is used in just about everything now we are saving money buying this in bulk from Webstaurantstore . We buy the real lemon lemon juice by the case. we have been using this for years for lemon aid, my daughter uses this for her lemon aid stand in the Summer, and we keep it well stocked in the home for the kids as well. my son absolutely loves lemon aid. sometimes we add sugar to it but most of the time he just adds it to a bottle of water alone. very good. very sour. I did not care for this lemon juice. It had an artificial taste to it due to some additives. I ended up throwing most of the bottle away. This is an unbeatable price. I love having it on hand for either when I bake or for adding a little lemon to my drinks. This product is just as expected and arrived packaged very well with no leaking. It is your normal ReaLemon in 48 oz. I did find the big box store had the same exact product for a few cents more in price without having to pay shipping and comes in a two bottle package. This big lemon juice comes in very hand around my house. We eat a lot of fish and like to put lemon juice on it. I also like to use it for marinades. Love this lemon juice! It is one hundred percent made from lemon juice. It is best used for cooking. It adds the perfect taste to a variety of your dishes. This is the only brand of lemon juice I purchase. It can be used as a direct substitute for fresh squeezed lemons without any chemical aftertaste. I have always loved the real lemon bread and lemon juice. It always tastes as if it is freshly squeezed. These bottles are also very large so the two will last me quite a while. We like this real lemon 100% real lemon juice. We use it to substitute fresh lemon juice when we don’t have it on hand. It’s made from real lemon so the taste is as great. We use it in a lot of things. Like for macerating pear slices to make pear-ginger pie. We love it. 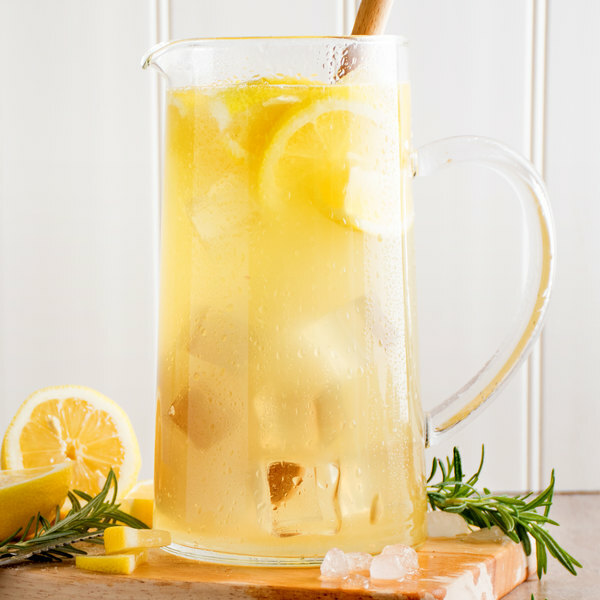 This lemon juice is perfect for adding a little flavor to beverages, or using in cooking meals. I use it with chicken for a zesty lemon chicken dish. The RealLemon 100% lemon juice is a great tasting product. The juice is just like fresh squeezed and is perfect for making lemon curd. The bottle is sturdy and stores well in our fridge. This is a great alternative when fresh squeezed lemons aren't available. The flavor is great and the price here is awesome for this size bottle. Realemon is perfect for the recipes that we need it for. It definitely has the natural real lemon juice taste that we need to use it for.